My latest recommendation is for summer vacation in Budapest. The city is a wonderful destination for a long weekend, especially if you can find a direct flight to it. The weather is pretty hot, so you can start with the outdoor and indoor thermal baths the city is famous for. There are a lot sightseeing places. In the evening, you can relax with a beer in an open air bars (bars close about midnight). For inspiration, you can check my pictures here. ~ Parliament – plan you day carefully. It’s good to be there at 8:30 a.m. and buy the tickets. For EU citizens its free of charge but they still have to go to gate 10 in order to receive the cards. The groups are fully booked in the high season. You cannot buy tickets a day in advance but you can book on the phone – check for this on the hotel reception. The building is quite big and imposing. The tour is about 30 minutes long. I was lucky with a guide with sense of humor and the time passed quick. The tour is very informative and I learned a lot that was not in the travel guides. ~ Buda – plan about 3 hours for the castle hill. The view is really breathtaking, especially the famous Fishermans Bastion and St. Stephan’s Basilica. Take a guided tour and go to the platform with a view to the entire city. 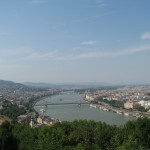 ~ Danube – the river is big and muddy, the bridges huge and impressive. The most beautiful and popular one is the Chain Bridge – do not miss to cross it and take photos in both directions. ~ Central Market Hall – you can enjoy a colorful bazar offering a lot of fresh vegetables, cheese, meat. It’s not very cheap but the food is extraordinary fresh and the sales people are very polite. ~ Synagogue – the entrance fee is too high (12 euro) and the only thing you can see inside is a grave yard. My recommendation is to have a walk out side and through the jewish quarter in order to feel the spirit of the place. I was not impressed by the visit because you cannot go inside the synagogue, you are left in the couryard/graveyard. More impressive for me was the shoes monument on the river side – sad and scary. ~ Vaci Street – pedestrian zone with souvenir shops (the items are overpriced), all kinds of cafes and restaurants. Take your time for two walks there – one in the day light and one in the evening – you will be surprised how different the street looks like. ~ Bus-boat – the ride is 30 euro. It’s very expensive compared to the normal boat and bus tours. Yet, my recommendation is to take it. You will have a interesting city tour, then the bus will go into the water and will be a boat for the next 45 minutes. You will see Margaret island and Parlament and the other monuments. 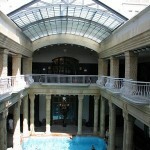 ~ SPA – I visited Gellert baths, the water was hot but the facilities are old. It’s more like a park, but I wouldn’t call it SPA at all. If you go there take your own towel, flip-flops, and bath cap. I’ve organized my trip as usual based on the information available at TripAdvisor site andvirtualTourist site. You can find there more inspiring ideas for your stay in Budapest. There are a lot of hotels in the down town. Trivago is my new favorite booking site. Look for a hotel on Vaci Street and you will not be disappointed. The food is delicious and at good price. You can have a dinner with drinks for two on the river boulevard for about 30 euro. Check the menu in advance, but even the luxury looking places are not very expensive. Enjoy your stay in Budapest and do not forget to comment! This entry was posted in Around the world on July 10, 2012 by ralu.